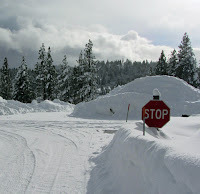 A series of storms in late 2012 brought heavy rains to the valley and a huge snowpack to the Sierra. The first snow survey will be conducted today, January 2, near Echo Summit on Highway 50. The survey is done manually in front of news cameras, but the results are already known because the state has hundreds of remote monitoring stations. The water content is important because the snowpack provides about one third of the water for California. The snowpack water content numbers for today are 133% of normal for the Lake Tahoe basin, with 134% of normal statewide. The valley rains replenished the state’s reservoirs. Lake Oroville, the state’s principle storage reservoir is 111% of normal. Lake Shasta is 113% of normal. California has plenty of water so far. Let’s hope the snow continues to fall. Go to the Department of Water Resources website to view snowpack numbers in real-time.